In the Mackenzie Delta of Arctic Canada, for example, large gas seeps have been observed in small lakes in the delta close to large discovered gas fields. These seeps have isotope and chemistry signatures similar to local deep gas fields and to the Mallik gas hydrate accumulation, which contain fossil, thermogenic methane. Permafrost is up to 500 metres thick in this area but oil industry seismic reflection data reveal the presence of what may be gas conduits through thepermafrost, from the deeper fossil gas accumulations (personal communication from the Geological Survey of Canada). It seems highly probable that similar situations will exist elsewhere in the Arctic, especially, in Siberia. 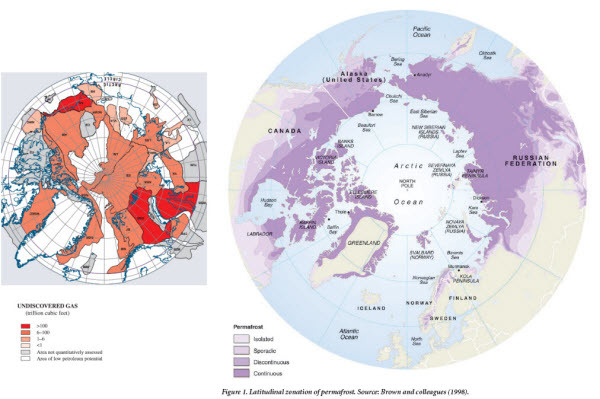 Cramer and Franke (2006) show examples of gas conduits, some of them through permafrost, in the Laptev Sea (see also part four of this series, for more discussion). Figure 1. 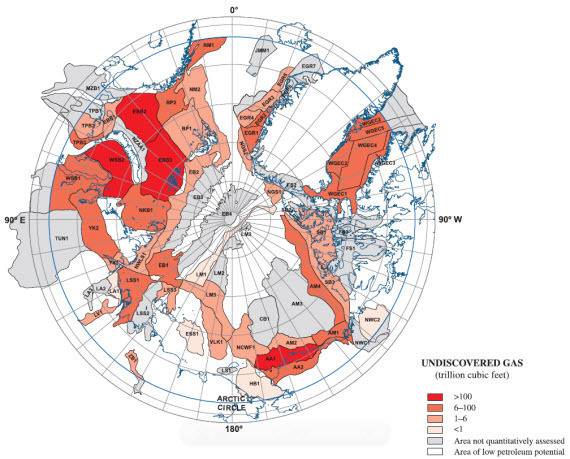 (Above) USGS assessment of Arctic sedimentary basins with potential for gas. The darkest shades of red indicate the areas with the most potential. Grey areas are not assessed and white areas have only low prospectivity; from Gautier et al. (2009). Compare this map, rotated and rescaled with a map of Arcticpermafrost, from Schuur et al (2008) below. Click here for big. In other words, we don’t yet know how much or how soon the release of trapped fossil methane will increase as the permafrost cap is breached as a result of climate change. In the far-distant future, after all the permafrost has been degraded, WA12 expects there to be long-term geological gas seepage at a rate of about 11 Tg per year from the entire Arctic, which would double the amount of seepage seen elsewhere on land from sedimentary basins. As thepermafrost cap degrades and is perforated, we might well expect to see short-term flow rates much higher than this. We shall speculate on this in part four of this series. Figure 2. 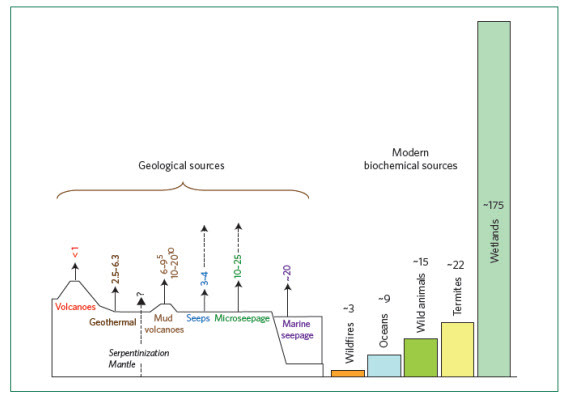 From Etiope (2012), comparing global natural geological and biochemicalsources of methane. The dashed arrows above the seeps and microseeps represent estimates of increases in seep rates in a far-distant future, after the melting of the permafrost and release of the subcap methane. During the melting of the permafrost on century scales there may be a faster transient release of pent-up subcap fossil methane but this has not yet been quantified. Units are Tg (million tonnes) of methane per year. Figure 2 shows the very large natural sources of biochemical methane in relation to estimates of emissions of geological methane. Anthropogenic sources of methane are not shown in this diagram and are roughly as large as the natural biochemical sources. The natural and man-made emissions of methane are approximately balanced by chemical reactions in theatmosphere that remove methane and by methane-consuming microbes in soils. There is a comprehensive review of natural sources of methane prepared by the Environmental Protection Agency. Because they are relatively small, geological seeps are often neglected in articles on sources of atmospheric methane (e.g., Wikipedia and the IPCC TAR). Recently, however, understanding natural seeps of methane has become important in determining baselines in areas whereunconventional gas production (fracking) is contemplated, such as in New York State. A 2012 paper by O’Sullivan and Paltsev, on the other hand, suggests that methane emissions from US shale gas wells, once flaring and reduced-emission completions are taken into consideration, may be small (~4%) in relation to overall fugitive emissions from the US gas industry. They estimate that, in 2010, emissions from shale gas operations in the USA amounted to 0.2 Tg of methane. This entry was posted in Hard Science and tagged Arctic, Methane, Permafrost. Bookmark the permalink.